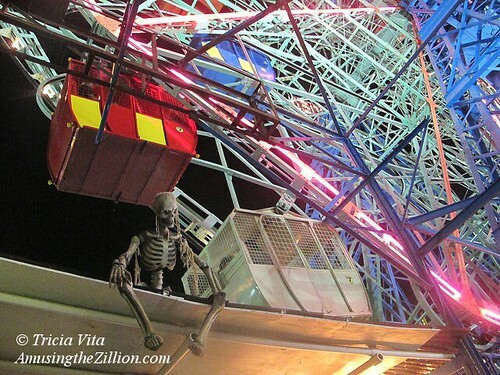 Deno’s Wonder Wheel and Spook-A-Rama Skeleton. September 7, 2015. Happy Halloween! Thanks to the extended season and the spooky holiday falling on a Saturday, which hasn’t happened in several years, Spook-A-Rama is open on Halloween Weekend for the first time ever. Coney Island’s legendary 60-year-old dark ride adjacent to Deno’s Wonder Wheel opens at 12 noon. November 1st is the last day of the season for Coney Island’s two amusement parks – Deno’s Wonder Wheel Park and Luna Park – which are scheduled to reopen on Coney’s traditional opening day, Palm Sunday, March 20, 2016. This weekend is your last chance to go for a first date or get engaged on the Wonder Wheel and brave the Cyclone roller coaster in 2015.